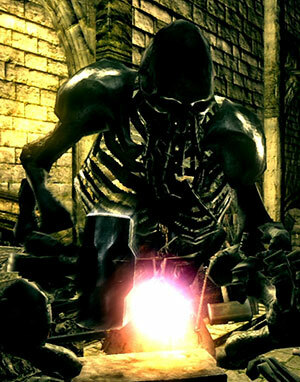 A skeletal blacksmith residing in the Catacombs. Specialized in fire enchantments. At the end of the spiral staircase near the fourth Necromancer (who's guarding a switch), look below. You'll see an item glow, a Green Titanite Shard, on a corpse below. Drop down to it (don't roll, as you may overshoot and slip further down below and the fall damage might kill you). From the corpse, drop down to the broken wooden plank below, then enter the hole. After the cutscene, you can access Vamos' room from the Skeleton Wheel area. Can reinforce weapons using the appropriate Titanite. Can ascend +5 Normal weapons to Fire weapons using Green Titanite shard. Can ascend +5 Fire weapons to +6 Fire weapons if given a Large Flame Ember, found in the Demon Ruins, between the bonfire and Demon Firesage boss room. Can ascend +5 Fire weapons to Chaos weapons if given a Chaos Flame Ember, found in the Demon Ruins, on the lava, guarded by many Taurus Demons. Can repair any1 damaged equipment for souls. Cost depends on the equipment's soul-cost-per-durability ratio and the amount of durability repaired. Opens another shortcut to the Skeleton Wheel area after his cutscene. If you answer "No" when he asks for any ember, he will keep asking the player the next time you start a conversation with him. 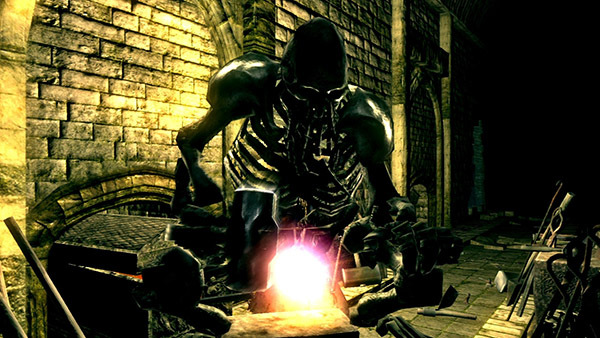 Be careful fighting the Bonewheel Skeletons in the area outside, they can come inside Vamos' room and kill him. … Be gone with you! … You'll spoil my focus. … What's that, then? Need some smithing? Then produce me some wares! What do you say? Why not leave it with me? I'll give you a flame to feast your eyes upon. Yes, yes, very well! We'll get these old bones to work! … Could it be the flame of the legendary witch? … I know! Suppose you left that ember with me? Old Vamos would never let you down, no, not ever! Keh heh heh heh heh! These bones won't fail me anytime soon. I'll come across another, eventually… Keh heh heh heh heh! … and ember, do you? Ahh, forget about it. I don't deal with that kind. What has gone wrong with embers these days? … Hmph! I'm here to smith, not to chit chat. … I've told you, I'm here for the trade, not for the talk! Enough with your presence. It disturbs me. Well, you are a persistent one, are you not? But I'm afraid I'm a mere blacksmith, it's just me and my trade. I would be of no help to a righteous warrior such as yourself. If that'll be all, then be gone with you! If I have anything to offer, it's my smithing, and nothing more. … You've got rotten manners. If it be smithing you need, the produce your wares. When leaving without doing anything. Well, what was that about? Don't be coming around here without a good reason! Trying to cause trouble, are you? I am Vamos the blacksmith, and I'm no bag of bones! 1. Excluding weapons in Crystal upgrade path, Crystal Straight Sword, Crystal Greatsword, and Crystal Shield.